A taprooted, short-lived perennial named for the spotted bracts immediately below the many lavender flowers. A single plant can have a single stem or as many as 20 stems. Blooms June through July. By the end of its first year, a knapweed plant is a small basal rosette. It usually bolts in the second year, producing branched stems. The leaves are alternate, deeply lobed, and pale blue-gray. Flowers are small, thistlelike, and light purple to pinkish purple or rarely white. The numerous flowers can produce as many as 1,000 seeds per plant. The seeds have pappuses (little hairs) that enable wind dispersal. This invasive plant prefers sunny, well-drained soils. It is often found in heavily disturbed sites, such as roadsides, gravel pits, and edges of agricultural fields, but it moves from those areas into undisturbed pastures, dry prairies, oak and pine woodlands, and rangeland. In a few years it can overtake and replace pasture grasses, native plants, and even other aggressive weeds such as sericea lespedeza. 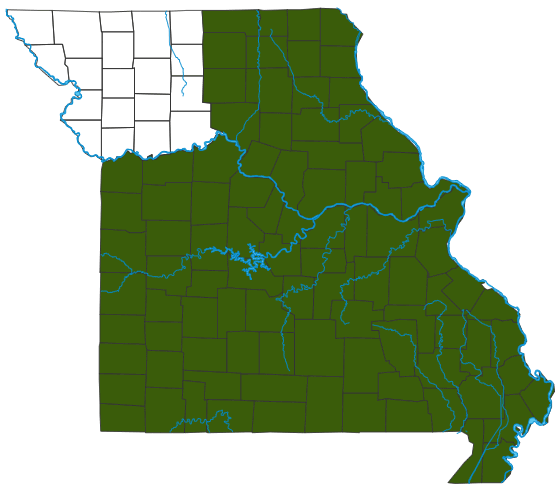 Southern, north-central, and eastern Missouri. Invasive. Spotted knapweed probably came to this country in the 1890s as a contaminant in commercial seed imports from Eurasia. The seeds are the main form of dispersal. A single square foot of spotted knapweed can produce 5,000 seeds, which can remain viable for eight years or more. As spotted knapweed seeds mature in late summer and fall, they can be spread on mowing equipment and in infested hay, seed, and gravel, or by hitchhiking on vehicles, other equipment, and even clothing. They can also spread by wind and water. Invasive plants have major economic impacts. For example, it is estimated that Montana loses 4.5 million dollars annually in recreation, forage, and costs related to knapweed control. This plant produces chemicals that inhibit nearby plants, reducing diversity in the area and degrading wildlife habitat. Wildlife and most livestock find it unpalatable, so as it spreads animals have less food. Runoff, erosion, and sedimentation increase, harming streams and aquatic creatures.